Two programming dock boards feature a USB interface for use with included development software (supports Windows XP or later, OSX 10.6 or later, and Linux with Java 1.6 or later). This is used with the module’s serial Command Data Interface to configure the module’s advanced features. Two prototyping boards are included to support custom circuit development. 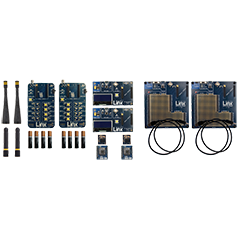 These boards have headers to interface with the modules, a regulated power supply, USB interface and a large area of plated through-holes for custom circuits.